With the state presidential primaries coming up in March, political groups are gathering on campus in the name of non-partisanship. Both Zach Summer, College Republicans president, and Angela Gutierrez, College Democrats president, agree that now is a crucial time for people of different political affiliations to band together for a common cause. “I think the important thing is we work together this semester,” Gutierrez said. A recent voter registration drive is not the only event the two groups will do together this semester, he said. “We’re planning a lot of collaboration with the College Democrats,” Summer said. Other activities scheduled for the two groups this semester are a charity fundraiser and laser tagging. “We want to do a fun activity that doesn’t necessarily include politics,” Gutierrez said. The Republicans and Democrats aren’t the only political groups assembling on campus. Brett Horton, Oklahoma City, has been on campus advocating Americans Elect, a non-partisan online nomination process designed to increase the number of candidate choices on the national ballot in November. He said that way, voters have more choices. The petition needs 90,000 signatures for an American’s Elect candidate to get on the general election ballot, he said. As of last week, Horton said, the petition had more than half the signatures needed. He said American’s Elect is trying to counterbalance the weight of the votes cast by early primary states. “We’re trying to get an online convention so the entire country can elect a candidate at the exact same time,” he said. Horton, Summer and Gutierrez each has a reason for being involved in politics. Horton said his is to expand the political field. Summer said he wants to see more voters. 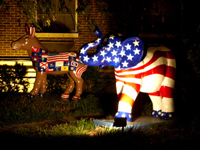 For more information on the College Republicans or College Democrats, visit https://occc.campusgroups.com/, or their Facebook pages: The College Republicans of Oklahoma City Community College or OCCC College Democrats. For more information on Americans Elect, visit www.americanselect.org. To contact Mary McAtee, email staffwriter2@occc.edu.